If you're a Canadian investor who's feeling ripped off lately, you're not alone. Canadians pay the highest fees in the world when it comes to investments in RRSPs and other registered accounts. Is this just because Canadians are foolish, or is there something more sinister at work? Now, and for the first time, The RRSP Secret reveals many of the financial industry's most closely guarded secrets - providing the individual investor an unprecedented view into how the financial system negatively impacts the financial freedom of most Canadians. More importantly, the book outlines specifically how to defend your wealth and use a little-known strategy to create double-digit returns - the same way the banks do. You'll never hear a bank manager or financial advisor tell you about this secret strategy, and you won't read about it in the newspaper. Why? Because they'd rather continue selling you underperforming investments that increase their profits instead of making you wealthy. The financial industry is a massive marketing machine that isn't designed to make you money, and the only way you'll become financially free is if you take control of your financial future - and this is your opportunity. 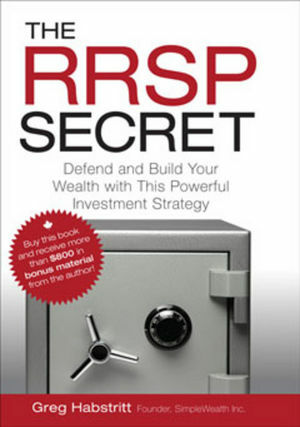 In The RRSP Secret, Greg Habstritt teaches you how to use the money in your RRSP, TFSA and other registered savings accounts to invest in one of the most reliable and secure investments available to you - and it's exactly the same strategy that the banks use to create profits themselves. You'll finally be empowered to turn the tables on the financial industry, and beat them at their own game. You'll learn how to invest for double-digit returns without having to take massive risks, or pay hidden fees and commissions. Stop being taken advantage of, and start making better decisions with your money. Your financial future starts now!
" Greg Habstritt is a multi-millionaire who can show you exactly how to build massive wealth by using cutting-edge strategies and a formula for predicting markets. I teach people to learn from the best, and there's no one better than Greg!" "I have known Greg Habstritt for several years and have always appreciated his integrity, honest approach, and willingness to ‘tell it like it is.' The concepts you'll read about have been used by wealthy Canadians for decades and now, for the first time, they're being shared in a very straightforward, step-by-step guide." "If you need street-smart skills on how to make millions in real estate like the pros do, then stop looking! Greg Habstritt teaches his secrets on how to build massive wealth through real estate investing. Greg teaches what he does and what works, and you can take that to the bank." As the Founder of SimpleWealth Inc., Greg Habstritt has become a sought-after investment and financial expert at North American training seminars and conferences. SimpleWealth provides industry-leading training and programs on success, prosperity, entrepreneurship and wealth creation, and has organized events that have featured some of the greatest minds of our time. Among the many world leaders that have spoken at Greg's events include His Holiness the Dalai Lama, Dr. Stephen R. Covey, Richard Branson, President Bill Clinton, President F.W. de Klerk, and many of the world's top authors, thought leaders and transformational experts. In addition to SimpleWealth, Greg is also the president of the Real Equity Group of Companies (a private investment firm) he founded in 2001. Greg oversees the ownership and management of a portfolio of residential and commercial real estate in Canada and the Caribbean, and has been involved in more than $200 million of real estate transactions. Greg serves as president and CEO, and is heavily involved in property acquisition, negotiations, financing, risk management and value amplification strategies for the group's diverse portfolio of properties. Greg and his family reside in Calgary, Alberta. For more information visit www.simplewealth.com.